What's behind all this anxiety? When you hear about prescription drug overdoses, you tend to think about opioid painkillers. But you may be surprised to find out that deadly overdoses from anti-anxiety drugs are on the rise, leaving many mental health professionals wondering what is causing the increase. A new study published in the American Journal of Public Health shows more Americans are overdosing on common benzodiazepine anti-anxiety medications, such as Valium and Xanax. The quantity of prescriptions filled tripled between 1996 and 2013, and the number of overdoses quadrupled during the same time period. Each year more than 5% of U.S adults fill a benzodiazepine prescription. These highly addictive drugs which treat anxiety, mood disorders and insomnia killed 23,000 people in 2013. 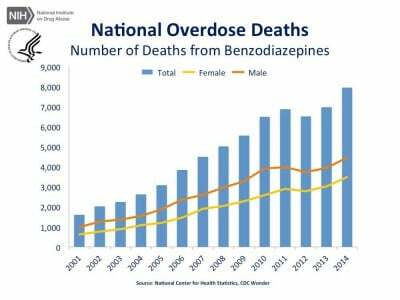 When benzodiazepines are abused or combined with other drugs and alcohol, they can depress the respiratory system sometimes fatally, Bachhuber explained. The researchers also found a similarly large increase in the number of pills each person was prescribed. The study’s authors warn anti-anxiety drugs are being over-prescribed and suggest doctors investigate alternative drugs or treatments, such as talk therapy. We reported earlier that public health directors and academics are pressuring the Food and Drug Administration (FDA) to put a “black box” warning on benzodiazepines, the agency’s strongest warning, because of the drugs’ addictiveness and the danger posed by combining these drugs with other medications.